“This list is a must for investors. Bookmark it.” That’s what Paul Farrell said about Yahoo! in his book Investor’s Guide to the Net, published in 1996. Of course, a lot has happened on the Net since then. Years are cons in cyberspace. Many Web sites have been created that rival Yahoo!’s ability to guide investors to online information, and many new types of financial news and research sites have become available. But Farrell probably still recommends Yahoo!. Today it’s much more than just a list. The site’s editors compile financial information from other news and research services and make it available through a customizable interface. To find a stock quote, type a ticker symbol in the box near the top of the Yahoo! 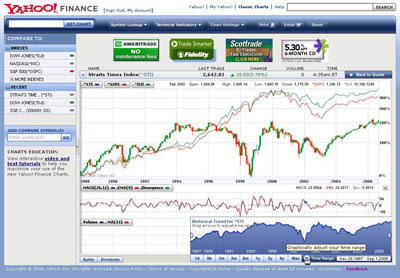 Finance home page. In the pull-down menu next to the box, choose the type of data you want to see – Basic, Detailed, DayWatch, Fundamentals, or Performance. Then click the Get Quotes button. If you type in ticker symbols separated by commas or spaces, you can receive up to 200 quotes at a time. A basic quote includes the last price, change, and volume (the information is delayed 15 minutes for NASDAQ and 20 minutes for other exchanges). The quote page also offers links to additional information, including a company profile, news, SEC information, insider trading activity, and a pricing chart. Near the middle of the quote page, you’ll see a “download spreadsheet format” link. You can click it to receive a data file readable by most spreadsheet programs, including Excel and Quicken. Besides stocks, mutual funds, and indices, you can look up information on corporate bonds, money market funds, and foreign exchange rates. (Again, use “symbol lookup” if you need the codes.) Stocks on major Canadian markets are available, too, but to find quotes for stocks from other foreign exchanges, click the appropriate country in the World Finance list near the bottom of the main page. Once you’ve established an account, select the link to go back to the main page and click “Create New Portfolio.” After you select the information you want to include, Yahoo! Finance will save the portfolio for you. Don’t include Canadian and U.S. stocks in the same portfolio. If you do, the total value the system calculates will not make sense: Quotes from Canadian exchanges are listed in Canadian dollars. The good news is you can create as many separate portfolios as you like. To view one, go to the main page and click the portfolio name you assigned when you created it. You might want to bookmark the portfolio page or even set it as the default start page for your Web browser. You can edit a portfolio anytime simply by clicking an “edit” link. Yahoo! Finance also offers a Java Portfolio Manager. To use it, you’ll need Netscape or Microsoft Internet Explorer version 3.0 or higher. The Java application offers several advantages over the standard HTML-based portfolios. For example, you can click any column to sort stocks by the type of information in it (e.g., by biggest gain). You also can drag and drop columns or rows. At this writing, the Java Portfolio Manager is in the beta stage, and many more features will be added to the final version. When quoting your portfolio, the data is not completely secure and could be compromised by (very resourceful) Internet hackers, or unscrupulous individuals with access to the machines at your site or the Internet Service Providers (ISPs) between your site and Yahoo!. We are considering security measures, such as a secure HTTP server. Until that time, do not enter any portfolio information if you are concerned that it remain absolutely secure. Yahoo! will not make your portfolio information available to anyone. After you’ve established an account, you can customize not only the portfolios but also several other Yahoo! Finance features. Click the “Customize” link at the top of the home page to choose news headline sources, configure the quote display, and modify the market summaries.